By May 1595 – almost two years into what would become known in Irish history as the Nine Years War – the relief of the Monaghan garrison had become crucial for the Crown forces. Bagenal led out an army of 1750 men from Dundalk and Newry on 24 May; O’Neill had besieged the garrison and his forces attacked Bagenal at Clontibret near Monaghan, inflicting heavy losses. Bagenal’s defeat, reported as a tactical withdrawal to Newry, was the first of O’Neill’s victories. Bagenal had to be reinforced and revictualled at Newry by sea, sending back his wounded to Dublin by that route, because O’Neill had blocked the Moyry Pass – the famed Gap of the North. By July 1596 he had raided Bagenal’s lands right to the gates of Newry. In December 1596, and again in June 1597, Bagenal successfully revictualled the garrison at Armagh, but by 1598 the more northerly fort on the Blackwater was in dire straits. Bagenal went to relieve the fort. He knew the terrain well as far as Armagh and had good guides, but his army was stalked by ill luck and outmanoeuvred by O’Neill’s forces. 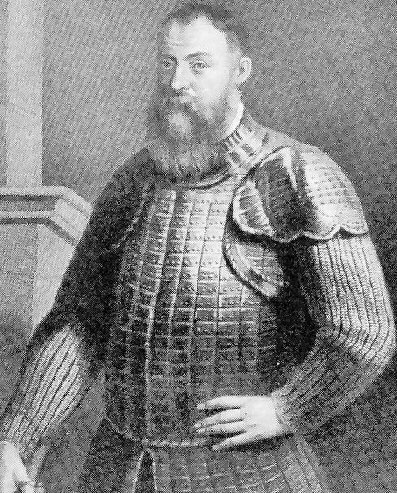 On 14 August 1598, on the field of battle at the Yellow Ford, Bagenal raised the visor of his helmet and was mortally wounded. Some dispatches say that his body fell into O’Neill’s hands, others that it was brought off the field with those who sought refuge in Armagh Cathedral and was buried there, but in all probability it was buried in his father’s church, St Patrick’s in Newry. Bagenal is also given a certain literary immortality in Sir Walter Scott’s romantic ballad Rokeby.